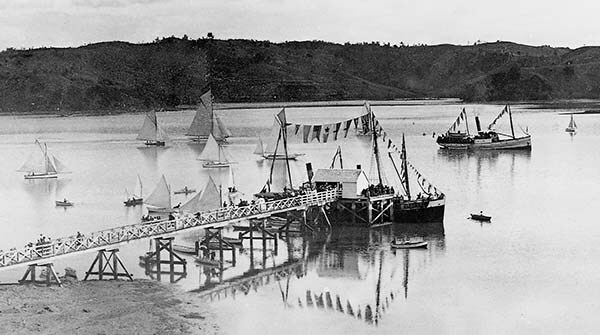 Not First But Best: The first Mahurangi Regatta is not recorded, although a local noted in his diary that the event was in progress as he returned to his farm from the colony’s Waitematā capital on New Year’s Day, 1858. Meantime, the first recorded photographically appears to be that so magnificently captured by the legendary Henry Winkelmann, on 9 February 1901. Mahurangi Action, established 1974 as Friends of the Mahurangi, revived the Mahurangi Regatta in 1977, and is responsible for the regatta shoreside events—the good old-fashioned leave-your-wallet-at-home picnic regatta at Sullivans Bay including small boat, running and swimming races, spud and spoon etc., and the prize-giving dance at Scotts Landing. Contact the secretary, Cimino Cole, on +64 27 462 4872, or by email. Mahurangi Cruising Club has been the regatta race organiser since 1990. Contact the commodore, James Buttle on +64 +64 27 275 6778, or by email.